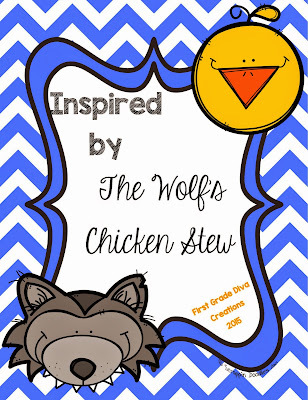 The Best of Teacher Entrepreneurs II: Vocabulary & Reading Response Lesson - "The Wolf's Chicken Stew"
Vocabulary & Reading Response Lesson - "The Wolf's Chicken Stew"
This mini literature resource is inspired by The Wolf's Chicken Stew by Keiko Kasza. This resource does not include the story. These mini literature resources are designed to help busy teachers! They can be used in many ways! Here are a few ways you may choose to use them. 1. Grab a copy of the book, print, and teach. They are perfect when you need just a little something extra to get you through a busy week! 2. They could also easily be left for a substitute teacher! 3. Homework is one of the hardest issues I face as a teacher. How do I make it meaningful and easy to manage? I am creating these mini reading resources to be homework packs for next year. I plan to print out vocabulary and reading response pages and send them home in a waterproof bag with a copy of the book. Families can choose to do a minimum of one vocabulary page and one reading response page. I think this is a great way to get quality literature in the homes of my students. The three vocabulary pages are meant to teach these three words deeply. These vocabulary pages can be easily aligned to CCSS. The first time I use one of these activities, I complete the vocabulary page with my students. I like to model technology, so I show my students how to use an online dictionary or thesaurus. I also model the use of a traditional dictionary or thesaurus. There are two different reading response pages included in this mini resource. These reading response pages can be easily aligned to CCSS.